Ben Costa is a writer and artist living in the Bay Area. He has self-published two volumes of his award-winning, martial arts historical fiction comic Pang, The Wandering Shaolin Monk. He has also done work for IDW, Viz Media, and SF Weekly. Throughout his life, he has maintained a steady diet of samurai comics, kung fu movies, spacefaring farmboys, and tabletop RPGs. Follow him at @BenCosta. James Parks is a speculative fiction writer and graphic novelist living in the Bay Area. James was weaned on monster flicks, ghostbusting, lightsaber duels, samurai cinema, and comics—with a sober dose of Victorian literature and ’80s cartoons. James is also the author of the Southern Gothic horror collection The Gospel of Bucky Dennis, was a staff writer for Campfire Graphic Novels, and is a current member of the Horror Writers Association. 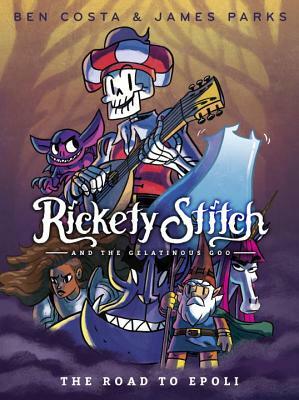 Find out more about Rickety at RicketyStitch.com.